We will be providing a quick download option with brief instructions here in the future but for this release, please read the important information below about this release. Since Enquiry Mate for Trainers was first released in May 2005 (nearly 12 year ago now), this is only the third upgrade which has warranted a new top level number. These major upgrade stages are actually related to the look and interface rather than the functionality which is being developed all the time. In fact, Release 3 was released in March 2009 so it has been nearly 8 years since we last had a make-over... and it’s about time I hear you say. The new look is... well... it’s new! If you look past the obvious visual difference, you will see that the system has not been changed greatly. The same items in the same place, with new versions of the same symbols. The Maintenance Menu has been reorganised into three columns, but the menu items are mostly in the same position. 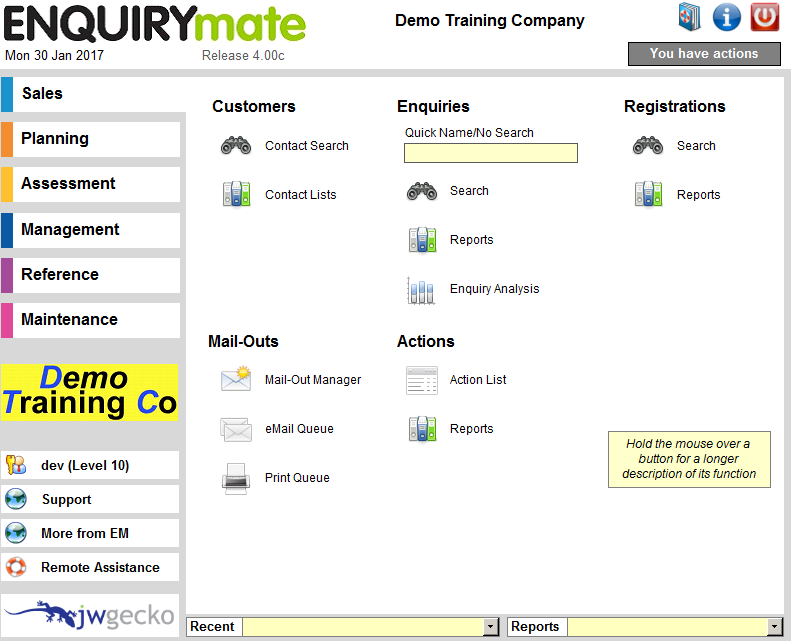 You might also notice that we are dropping the "for Trainers" from the branding, so "Enquiry Mate for Trainers (EMT)" is now just "Enquiry Mate (EM)"! Similarly, the Close, Help and common Add, Edit and Delete buttons at the top of forms are now graphical but very consistent. Any buttons that didn’t fit the standard function still have words. You might notice that the Close button is always in the same position so you don’t need to move the mouse to close several levels of forms. Most of the small buttons on the forms have not changed. These icons will be replaced in the near future with nicer looking images (of the same object in most cases). You will notice that the field labels and outlines are light greys to provide guidance but the focus is on the data values which remain in full black-on-white contrast. The new look was only made possible by moving to a new base Access version (2010) and the back-end file formats have been updated to the accdb and accde formats (replacing the mdb and mde formats). This complicates the update process slightly (once only). Clients on MS-Access back-end databases will need to update to the accdb format (introduced with 2007 along with the doc to docx and xls to xlsx format changes). Client who are using versions of Access prior to 2010 will need to update to 2010 or a later version. This can be the free runtime version of 2010, 2013 or 2016 (2010 or 2013 is preferred as 2016 is still a bit new). The most obvious new thing is the Quick Name/No Search on the Sales menu. This is a shortcut for an Enquiry Search where you can type the name of a student or customer (“Firstname Lastname”, “Lastname, Firstname” or just ”Lastname” or a numeric student number and the Enquiry Search form appears with the search fields inserted and the results are on the way. You may have noticed that the system gets busy when you return to the Enquiry Search form. It was running the fuzzy logic name search again (in case something has changed). It now stores the previous list of matching contacts and redisplays them along with any new contact added with the New Contact button, which should be a lot faster and produce equally useful results. Many clients are in the process of adding the JWGecko online enrolment and/or online learning management system (LMS) and linking them up to EMT. There are now more options than ever in the interface. Our built-in USI verify function is mature and ready for use. As well as the big stuff, there is the usual updated to comply with reporting and compliance rules including the new SHORT and INTOFF options for USI, optional use of "Not Available" outcome (90), a major update of WA reporting (both AVETMISS and RAPT), and other minor rule changes. We will be moving to standardise all client implementations to enable a simpler update process in the future, but this update will involve some one-off intervention to convert the file format of existing Access databases and transition to Access 2010 (of higher) for some clients. Further to this, because of the significance of this transition, this will be a mandatory update and we will be moving to a context where everyone stays on the latest version at all times. We are finding that we are spending too much time finding issues that turn out to be a problem that has already been fixed in a newer version. The system will gently now prompt you that a new version is available and will take you to the update page by displaying the version number in red on the main menu. Please contact JWGecko support to schedule your update.